Joe McCarthy has published a web site with a wealth of information on two issues close to my heart: electronic voting and incineration. Aptly named fiasco.ie, it contains documents compiled from Joe’s freedom of information requests on eVoting, and extracts from his submission to An Bord Pleanála on the proposed incinerator at Poolbeg. It all makes for interesting reading. And if that whets your appetite, you can read the submission I drafted for John Gormley on the incinerator. This entry was posted in Climate change, eVoting, Planning on 2/11/2006 by ryano. This is something I’ve wanted to see in a newspaper for ages – a feature on visiting far-flung parts of the globe without stepping on a plane. The Guardian sent three journalists via train, bus and boat from London to three different destinations: Thailand, Cairo and Ibiza. Although I’m not usually a big fan of travel writing, I found each of the stories fascinating, perhaps because the political context gives them an extra edge. 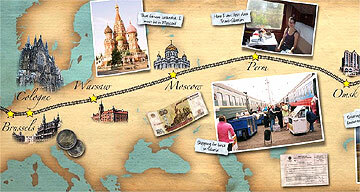 For the most part, these travelogues are a serious attempt to get to grips with a post-aviation world. Predictably, in all cases the rail option works out significantly more expensive than the equivalent journey by air. However the journalists all travelled by first class rail for at least part of their journeys and some of the cost was accounted for by hotel stays made necessary by the nature of the trips. A rough calculation of the carbon emissions attributable to the journeys showed a clear advantage over air travel, except in one case where the writer took a very roundabout route, mostly by bus. The other significant factor is the greatly increased travel time – in the case of the trip to Thailand, the writer spent the best part of a month travelling across Russia, China and Vietnam. If we do get serious about aviation and climate change, will journeys like this become the new long-haul holidays? Is there any prospect that rail fares will come down in the same way that air fares have over the past decade? Will projects such as a tunnel between Spain and Morocco become feasible? Will high-speed trains allow us to reach further afield without devoting fortnights to travelling? Reading these accounts makes me think that a new golden age of rail travel might be one positive outcome from the changes that climate change will force on us. However they also make it clear that rail travel is currently very much the poor relation in holiday-making terms: you have to be exceptionally committed and rather wealthy to use rail as your long-haul option. Of course in Ireland, embarking on any sort of rail journey to Europe or beyond involves first getting off the island. I priced a ferry journey between Dublin and Holyhead at €29, with a standard train fare from Holyhead to London costing about €100 (£65). These days it would be difficult to pay more than that for an air fare. It’s not crazy money, but you would be giving up a whole day travelling. There’s also a page on the Guardian’s Travelog site where you can discuss the issues: Is it realistic to give up flying? Update: Ciarán Cuffe has posted about his experience of a low-carbon long weekend in Paris. This entry was posted in Climate change, Political, Transport on 26/10/2006 by ryano.